Welcome! We are at week 3 and I’m starting to panic a bit! I realize this is a very small room but the weeks are going by too fast. I give so much credit to all of the people doing a bigger space! One big space that I’m watching is Vanessa Francis… she is doing her basement, it is going to be amazing and I can’t wait to see it! 1. 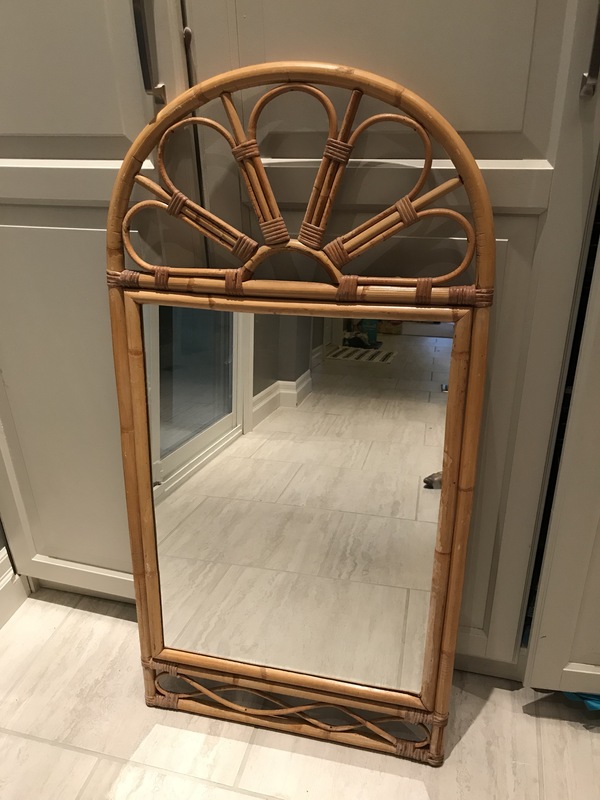 I found a mirror on Kijiji but the owner of this mirror lived hours away!! (I hate when this happens) Luckily for me, her husband was driving by my area for business and I met him yesterday to pick it up! Lesson for everyone out there…. just ask, you never know what they will say! I bought this mirror from a couple who used the mirror for their Hawaiian themed wedding receptions, they wrote the bar menu on the mirror! I love it and I can’t wait to paint it. I have some extra white paint that I will used on it. 2. Art – I connected with Niki Kingsmill who is a very talented artist, I will be contacting her very soon with some ideas! 3. Wallpaper! I chose this wallpaper and it arrived yesterday from Wayfair! I’m so excited, the wallpaper will be installed next week! I am very excited for this big step as I think it’s been about 4 years that I have wanted to see wallpaper in this room. I wanted something fun and a bit different but this room is used often by my kids so I didn’t want to get too crazy so when I saw the cranes wallpaper I knew it was the one! The Jade colour works well with the room! I need some help with the powder room, should I add pot lights to the powder room? or keep it just with the sconces? I didn’t even think of pot lights until I saw a room with them and it was a powder room! Good luck to the rest of the participants, don’t forget to check out their progress for week 3! Wallpaper is c/o of Wayfair. All opinions and thoughts are my own. Your bathroom refresh is coming along! Like your inspiration photos from last week. And, the mirror will be perfect painted white with your wallpaper! Good luck! Not too late! Thank you for your input… we will only do the sconces. And I hope things work out for you, I’m sure they will! !